More often seen as a garden escape with variegated leaves (see above), wild Lamium galeobdolon seems to be less common in Britain than it used to be. In common with White Dead-nettle, this creeping perennial of the Mint (or Dead-nettle) family is much more nettle-like in appearance than is its close relative Red Dead-nettle Lamium purpureum. Indeed, this spring wildflower is sometimes referred to as Yellow Dead-nettle. Plants form dense patches with erect stems rarely taller than 30cm, and they produce rooting stolons (runners). Stems are finely hairy, as also are the long-stalked heart-shaped toothed leaves. The outside surface of the flower lips are bright yellow, as are the insides which are decorated with reddish brown honey guide markings that are said to direct pollinating insects towards the flower's store of nectar. Noticeably fringed with eyelash-like hairs, the upper lip is single-lobed and helmet shaped, while the less hairy lower lip is divided into three lobes. Individual flowers are 17 to 21mm long and form typically three moderately-spaced tight whorls around the stem. 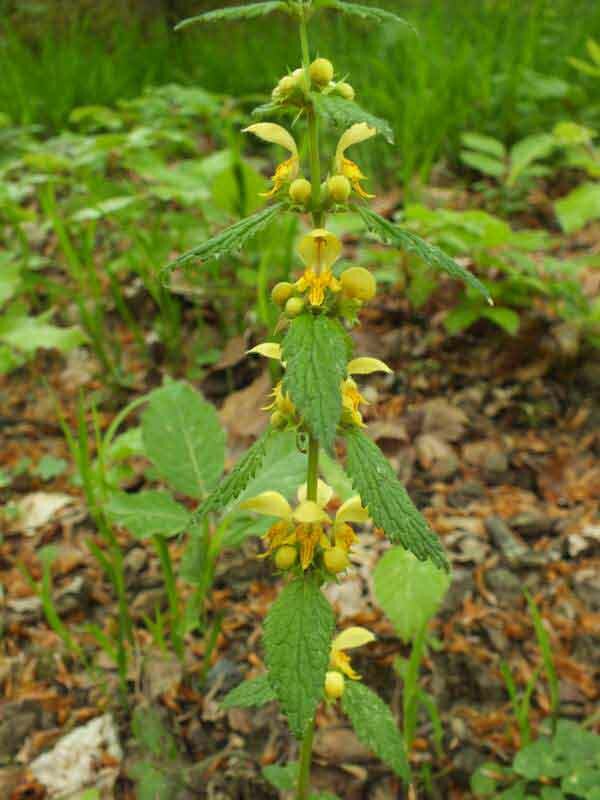 Truly wild Yellow Archangel has all-green nettle-like leaves with long stalks; the plants shown on this page are naturalised garden escapes of Lamium galeobdolon ssp. argentatum, a popular garden plant with silvery blotches on the leaves. 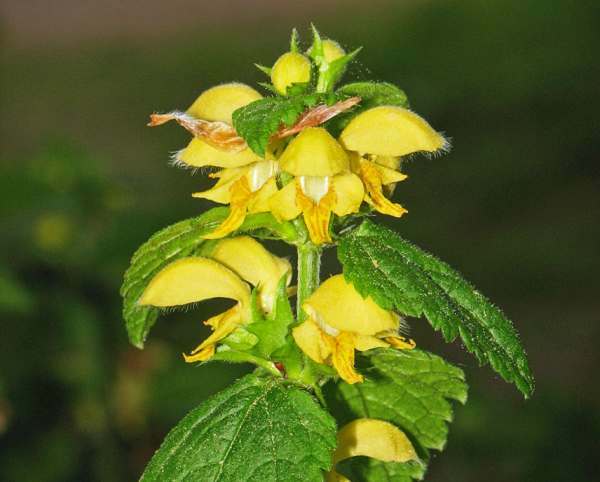 Yellow Archangel is locally common in parts of England and Wales, but it is seldom seen in West Wales, in the far north of Britain and in Ireland. This plant prefers dampplaces and partial shade. Being a perennial, Yellow Archangel takes a time to become established, but once it get going it crowds out most other plants. Some colonies are thought to have survived in some places for hundreds of years in undisturbed sites. 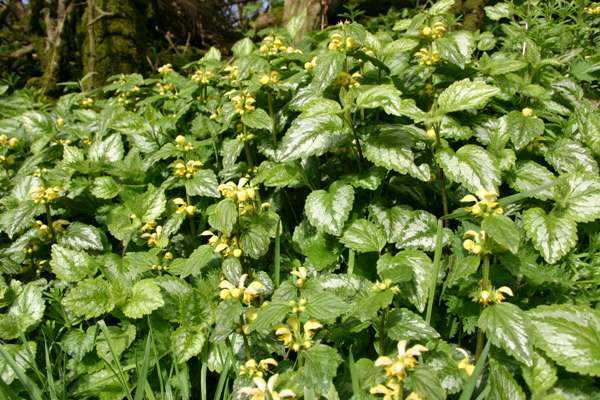 In his Flora Britanica Richard Mabey points out that Yellow Archangel often grows among Bluebells Hyacinthoides non-scripta on woodland edges or within light deciduous woodland, and its yellow flowers appear just as the Bluebells fade and die back. Partially-shaded hedge banks, ditches and corners of scrubland are other places where Yellow Archangel sometimes grows wild. 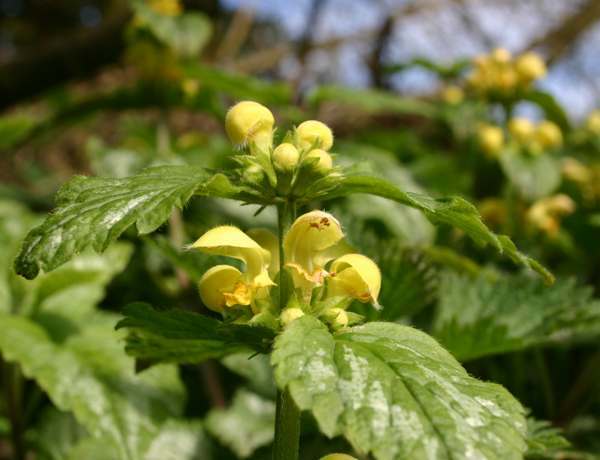 In Britain and Ireland the main flowering period of this wildflower is May and June, but following a mild winter you may find Yellow Archangel in bloom as early as April. 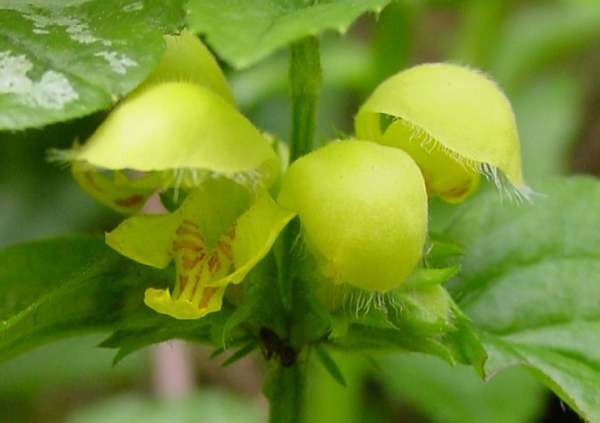 As well as being cultivated for ornamental use in parks and gardens, Yellow Archangel is greatly valued by bees and many other kinds of insects, because, as with other members of the Dead-nettle group, each of the flowers contains a tiny drop of nectar at its base. Lamium, the genus name, is the Latin word for Dead-nettle; however, plants of this family were once known as Labiatae, and labia means lips. The distinctive two-lipped flowers of the Lamiaceae are sometimes referred to as bi-labiate. Picture above by Darkone, (Own work) [CC-BY-SA-2.5], via Wikimedia Commons, shows wild Lamium galeobdolon photographed in Germany. This species has recently been transferred to to genus Lamium, and so many field guides will list Yellow Archangel under the synonym Lamiastrum galeobdolon. The unpleasant smell of crushed leaves of Yellow Archangel is the source of its specific epithet galeobdolon, which means 'smelling like a weasel'. Not everyone is familiar with the odours associated with such small nocturnal mammals, so getting hold of Lamium galeobdolon may be the easiest solution for those keen to know what weasels smell like. White Dead-nettle Lamium album has, as its common and scientific names declare, white flowers. The photographs of Lamium galeobdolon ssp. argentatum shown on this page were taken in West Wales and in Surrey, England.